There are perks to being an internationally-renowned sports writer. If you are one, I’m sure you know what they are. It seems that there is also the occasional Brucie bonus available to those that have created a small (but perfectly-formed) weblogpedia. You may remember that I was fooled into taking part offered the opportunity to take part in a spin session in a dark room in London. I’ve also been sent a book for review. Now Wiggle has been kind enough to send me a couple of bits of clothing to try out (and I’m assuming they want me to write about them). It is impossible to write without bias. If someone sends you something nice in the post (without the transfer of filthy lucre), you will be more likely than not to write nice things about it. I would imagine that’s the case here. The only way to deal with this is to mention it up front. Which is wot I is doing now. Innit. 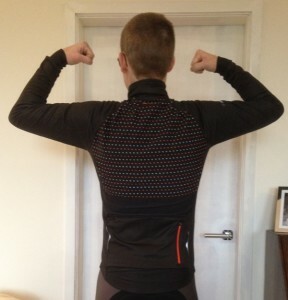 Wearing the dhb Blok Micro Softshell Windslam Roubaix Jacket. Mont ponders whether ‘selling out’ in order to get a free jacket is worth it. Which, to be frank, is a ridiculous name for a garment of any persuasion. Let’s try to unpick it (figuratively – later in the review I’ll attack it with a kitchen knife in order to assess ‘durability’). dhb is the name of Wiggle’s own-brand, er, brand. It has the annoying characteristic of being all lower case, which makes the start of this paragraph look wrong. But dhb is also (I sense) becoming increasingly well-regarded amongst cycling folk that know their onions (I don’t mean the French). If you’re worried about being tarred with the poseur/ all-the-gear-no-idea brush that comes with a Castelli and Rapha wardrobe, then dhb could be your cycling clothier of choice. A quick glance at the range on the website seems to suggest that dhb ‘pieces’ come with plenty of style. At the same time, whilst wearing them, you can exude the warm glow that says, ‘I haven’t overpaid for my virtually all-black lycra’. Which is the sort of understated smugness that I like to aim for. As an aside, I bought a dhb cycling top way back in the mists of time, when the internet was powered by coal (~2006) and it was a bit pants in terms of fit and material. We’ve come along way since then (baby). For completeness (remember, we were ‘unpicking’ the name), I think (think) ‘Blok Micro’ is the description of the print on the jacket (so the numerous small white and orange crosses that adorn the chest). Right, time to get technical (my forte). Softshell (like the crab). Windslam (the four most important international farting tournaments). Roubaix (French for curry). I think what dhb is getting at is that this jacket is designed to be an outer layer that has some degree of softness whilst still being resistant to wind (of the externally-generated variety). By extension, and presumably omitted for reasons of space in the title, it has an element of resistance to rain showers. 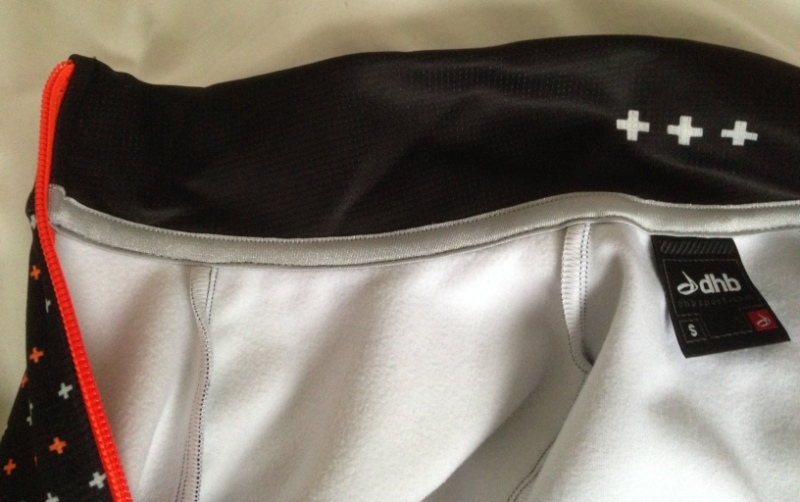 The ‘Roubaix’ element refers to the fleece lining to the jacket material, which provides extra warmth and, as I just discovered on my most recent ride, makes it comfortable to wear directly over a pair of bib shorts, without the need for a base layer. In short, this feels like a well made piece of kit, hewn from good quality fabrics. The fit is described as ‘performance’ (unlike my riding). So it’s snug. Thankfully though, not snug in the ’emphasising all your unsightly bulges sense’. In fact it’s pretty flattering, as the photos may attest*. The colourful print up top tends to draw the eye away from the ‘lower thorax energy stores’ and creates what can only be described as a pleasing silhouette (surely they must say that in Vogue?). For what it’s worth, I’m 5’9 (5’10” on a good day) with a 36-37″ chest. I’m generally a ‘small’ in clothes (a perfect small) and, as it turns out, I’m a ‘small’ in dhb performance fit cycling clothing. Good times. 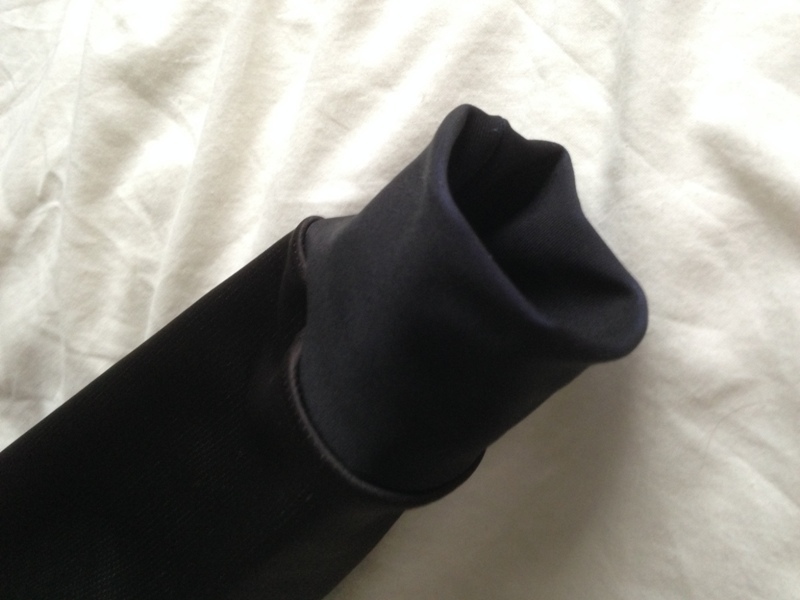 … before moving on to demonstrate photographically a cuff (of which there are in fact two) and note that it (they) is elasticated and forms a nice snug join to prevent ingress of water or wind. 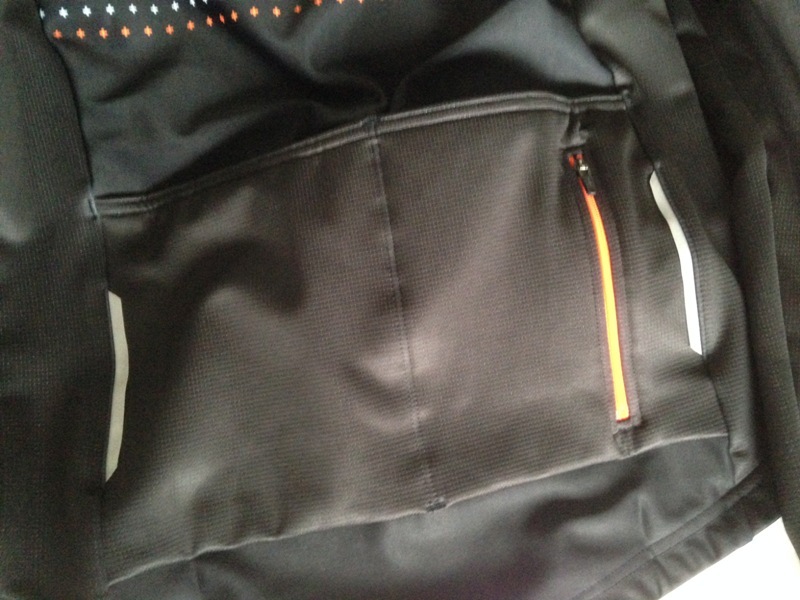 Here we see the nice bright orange zip and the silicone gripper that seeks to prevent the jacket riding up your bum when you’re in action. Moving on, a fine pair of pockets. You will note the flashes of reflective material, which do seem faintly ridiculous on a jacket that otherwise has the high-vis properties of a special forces operative. In a dark room. Without windows. Holding a black hole. 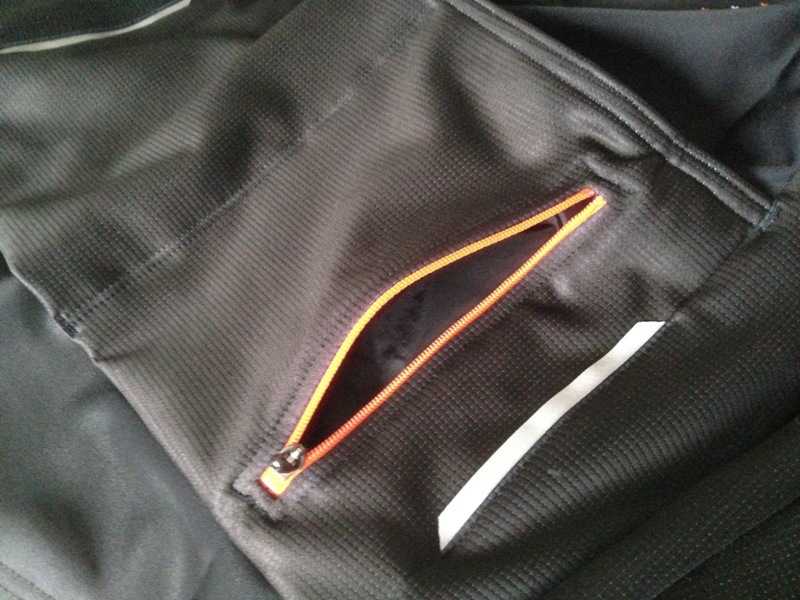 More useful is the handy zippered pocket that, on further inspection, is made of waterproof material and a prime spot for secreting your coffee-and-cake-tenner. According to my recorded data (I knew there was a reason for the Edge 510 to have a thermometer), it was 10 degrees C on ride 1 and 12 degrees C on ride 2 (yes, very mild for November). Both times there were spots of rain and plenty of wind. Ride 1 I was wearing a base layer (and I was trying out some dhb roubaix bib tights (review to follow) which no doubt provided extra insulation); ride 2 I was bare back (my preferred persuasion). To the extent that I noticed the performance of the jacket (and not noticing is probably a good thing for a piece of clothing), it was close to the start (when I realised that the heavy gusts of wind weren’t permeating the jacket) and towards the end (when I realised that I was toasty, verging on slightly overdressed). But Does It Wash Well? As a well-adjusted male, I asked my wife to wash the jacket and report back. She did the former but not the latter (note to self: discuss staff training*). *And note to audience, (i) I’m being ironical; and (ii) like Batfink I have a shield of steel when it comes to accusations of chauvinism (my three years as a stay-at-home dad to pre-schoolers). I tried it on afterwards and it hadn’t shrunk. So that’s a tick in that box. I am a Yorkshireman built in the classic mould (deep pockets; short arms). I’ve already been sent a free jacket. So I can’t say for definite that I would have bought this jacket. But this was primarily because I was getting by with cobbled together wet/windy/cold weather riding gear. If you’ve been round here long enough, you may be sick of me going on about wanting a Castelli Gabba jacket (which I’ve never even seen, let alone bought). I can honestly say that now, knowing that this dhb jacket fits me well, looks good and does everything that the Gabba purports to do, I’d buy this one over the Italian jacket of dreams (sew it and they will come). Even if the dhb Blok Micro Softshell Windslam Roubaix jacket only performed at ’85-90% Gabba’, the fact that it’s £100 cheaper than the Castelli offering, I’d be hard-pushed to see beyond the dhb. 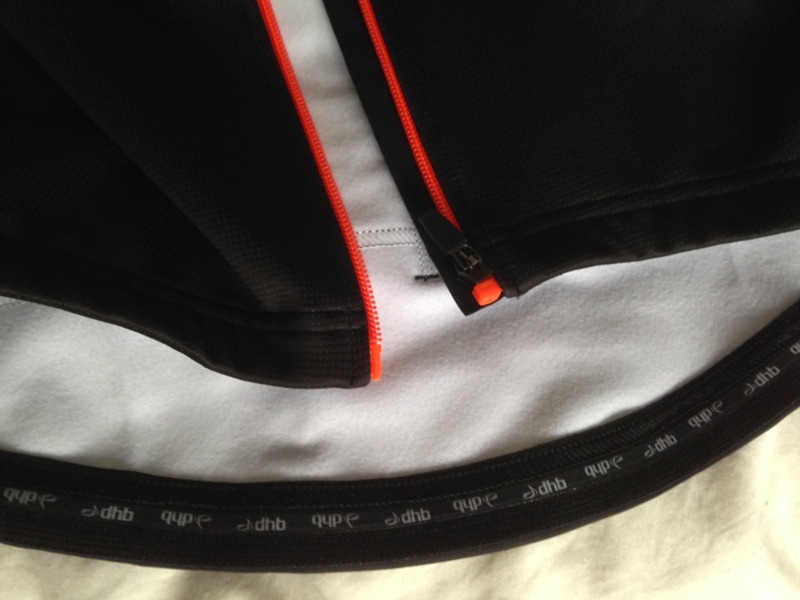 Where Can You Buy Your dhb Blok Micro Softs… zzz… Jacket! Good question. With an easy answer. It’s only available at Wiggle. Just click this link to find out more (and buy it if you like). Note: The link to Wiggle is an affiliate link. If you click it and buy anything, I get a small percentage commission, which goes towards keeping the lights on at Sportive Cyclist towers (okay, okay, I spend it on hookers and coke). Very nice Sir. 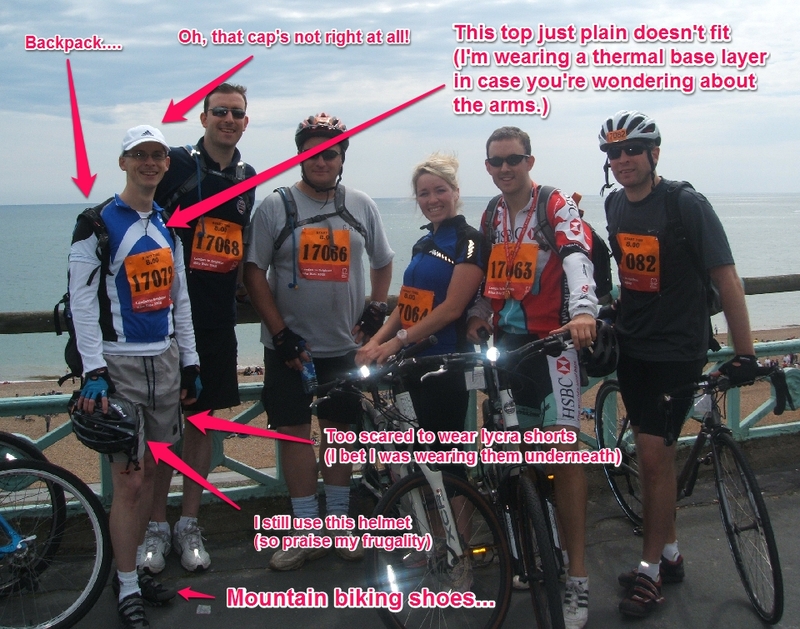 To be fair you were the most technical of all of us on the L2B in 2008 – I was in a non wicking long sleeve, bib shorts with a perished rear pad and puma trainers! 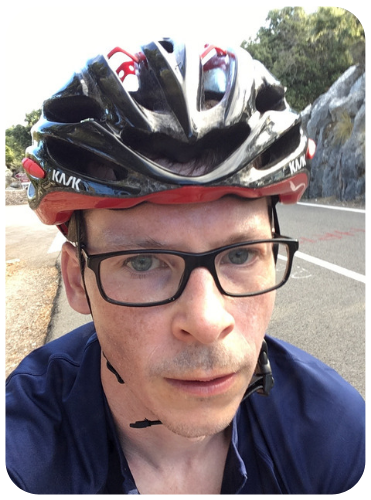 Thankfully we’ve all progressed since (Rapha these days me… But only when they’ve a sale on!). PS nice pics. I have one of these jackets (Ladies version and possibly last season’s design) but I love it, insofar as I love cycle gear. It appeals to my eagle-eyed parsimonious side. Having Italian blood I, too, would love something Castelli and I drool over tthe displays in my LBS everytime I go, but said parsimonious streak would never allow me to spend the fortune they ask when I can get something so Doodie from dhb for my humble requirements and much much less mazuma. 🙂 Even better, the darn thing is really toastie! 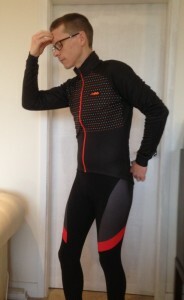 I have both the dhb Windslam Roubaix jacket (non Micro blok) and the Castelli Gabba 2. Would I say the Castelli is worth the extra £100, the answer would be no. The dhb jacket has been superb. The trick with every item of clothing is to establish its optimum operating temperature range and then to compensate and layer up if below that range. I must have about 10 items of dhb/Wiggle clothing and can not fault any of them (except for some of their bib/short pads can be a little uncomfortable for me after 4+ hours riding). Interesting review and I concur with J about dhb clothing. I’ve got various of their items, mostly jerseys in different weights and including a very toasty Windslam jacket from last year, and I can’t fault them for the price. I don’t think I’d want to spend a (Castelli-type) fortune on a piece of sporting kit that’s probably going to have a hard life and get grotty after a while anyway. Nice article, Monty! I love my Gabba 2 jersey, but I’m parsimonious by nature, so like to pursue alternatives (e.g. 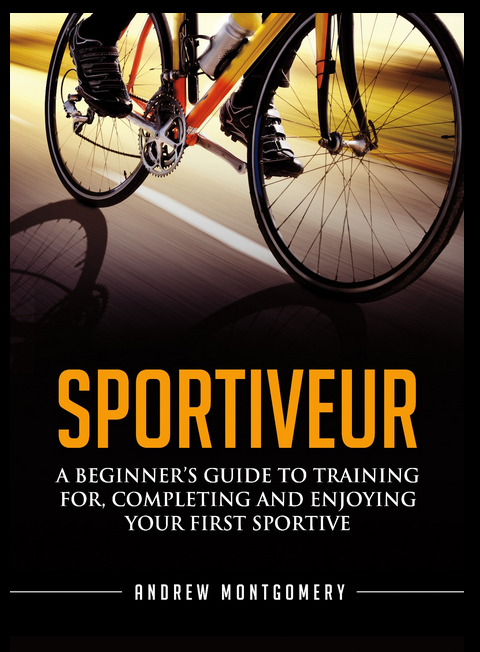 Sportful’s offerings) as well. I’ll have to add dhb to my watch list. Thanks!